One of the most interesting forgotten stories of the 19th century involves one Polish philosopher in possession of mysterious knowledge, one French banker looking for Truth and, most importantly, a lot of money. Culture.pl presents a scandal that startled the France of the early 1800s. In 1834, the lauded French author Honore de Balzac published one of his lesser known novels: The Quest of the Absolute. It tells the story of Balthazar Claës, a rich man who studied chemistry under Lavoisier and decided to devote his life and fortune to the pursuit of science. In the novel, Claës meets Adam de Wierzchownia, a retired Polish officer who tells him of his own chemical research – the officer claims that by decomposing simple substances, he has reached the point where he is almost able to obtain the principle of matter that would disclose to anyone all the truths of chemistry and the universe. Unfortunately, as his financial situation made it impossible for him to conduct the necessary experiments, he is forced to sell his notes to somebody capable of achieving his goal. Overjoyed, Claës quickly pays the requisite sum and begins his work. The rest of the novel, unsurprisingly, deals with Claës’s failure to do anything useful with the notes, and provides a depiction of his deteriorating mental and physical health. The naïveté of the amateur chemist is so astonishing that it is almost too difficult for readers to suspend their disbelief. But what if I told you that it was, in fact, based on a true story? In 1800, Józef Maria Hoene-Wroński, a 24-year Polish emigrant arrives in France. Despite his young age, he boasts an impressive résumé – at the age of 19, he ran away from home to join the Polish army and soon after the 1795 final partitioning of Poland was recruited by the Russians where he served as an officer in the artillery. Despite his exceptional record and numerous decorations, he quickly decided that his calling lay elsewhere. He went to Germany to study philosophy and mathematics – the pursuit of truth remained his motivation until the end of his life in 1853. He first settles in Marseille, where he joins the Marseille Scientific Society and begins working on his treatises. Although he publishes several works, they remain largely unknown. The funds he inherited after the death of his father (his family was part of the Polish nobility) run dry, so Wroński is forced to give lessons in mathematics to support himself. Taken in its totality, his stay in Marseille would have been rather insignificant if not for a single important event. On 15th August 1803, during a ball held in honour of Napoleon’s birthday, Wroński comes to a sudden realisation: he has discovered the Absolute, the principle that has guided the creation of the universe and all of its laws. The development of this Absolute quickly becomes his most important task. 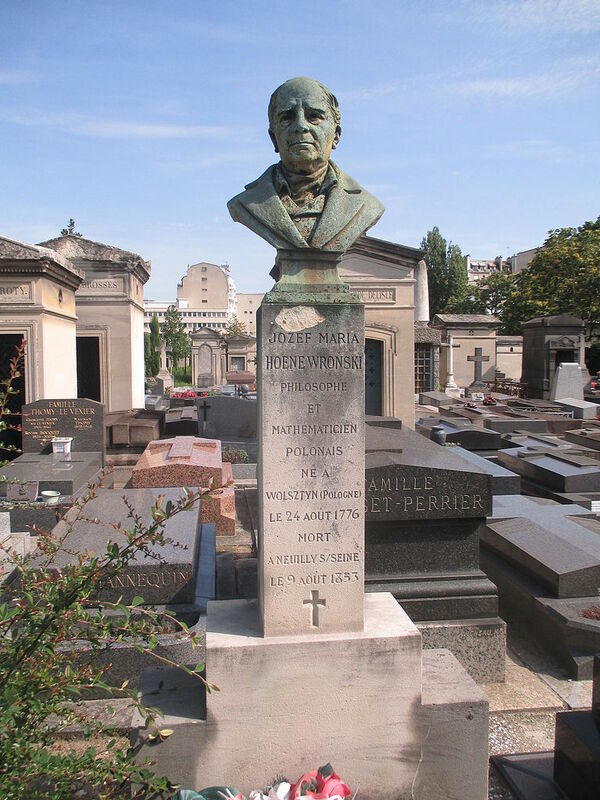 Exhausted by the lack of recognition his ideas receive in Marseille, Wroński decides to move to Paris, hoping to find a more attentive audience there. He does so in 1810, shortly after falling in love and marrying Victoria Henriette Sarrazin de Montferrier. Unfortunately, the Paris scientific scene is just as inattentive as its Marseille counterpart. Wroński is forced to spend more and more time on giving math lessons and he spends most of his earnings on publishing his numerous works. However, even his teaching quickly proves insufficient when in 1812 both his wife and their infant daughter fall to a serious illness. It ends in the death of the child. Devasted, the philosopher is also strapped for money – any fame he might have gained in the Parisian scientific circles was due not to his publications but to the fact that he now dressed in ragged clothes and wooden clogs after he had to sell his shoes to buy medicine. He realises that he cannot continue without a patron and asks his friends for help. One of them introduces him to Pierre-Joseph Arson, a wealthy banker from Nice, who has grown tired of trade and finances, and since moved to Paris to devote himself to the study of mathematics and philosophy. It’s a perfect match. The money Arson pays Wroński is enough for the philosopher to cover everyday expenses, but, as is often the case with money, it does not match his ambitions. Wroński soon decides that the secrets of mathematics he discloses to Arson are worth much more than he is being paid, and proclaims that from now on, he will only teach him about astronomy. But, as it turns out, he is such a skilled astronomy teacher that the men quickly move to matters so complex that the pay is insufficient even for the study of celestial bodies. After lengthy negotiations, Arson agrees to pay Wroński 3,000 francs per year (to put this into perspective, at that time the salary of a cook in a wealthy bourgeoise house amounted to 350 francs per year and a house servant could earn around 500 francs), and to rent and furnish him an apartment (the furniture alone cost 10,000 francs, because Wroński wanted only the most expensive and luxurious pieces). Most importantly, he also agreed to publish Wroński’s works for the next five years. Although this convinces the master to continue teaching mathematics, it still does not satiate his appetite – he wants to have his future provided for. Annoyed by the philosopher’s complaints and encouraged by the progress he has made, Arson stops taking his classes (although he still pays for them) and devotes himself to just publishing and promoting his master’s works. This includes numerous services, such as delivering Wroński’s books and best wishes to the Russian Tsar. 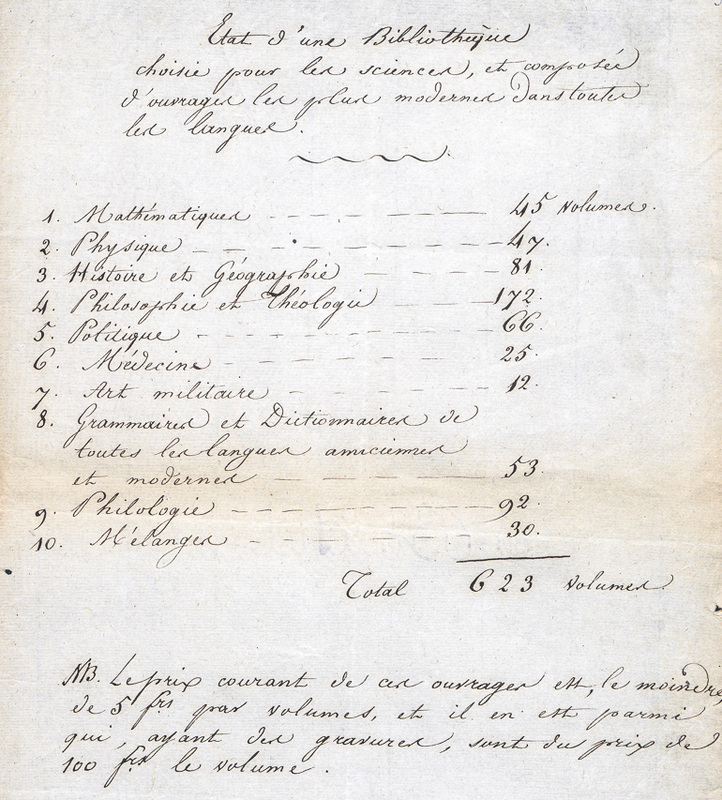 Moved by his pupil’s loyalty and progress (and perhaps, to some extent, by the state of his finances), Wroński decides to disclose the greatest of secrets to his pupil: the formula for the Absolute. This, however, obviously requires a stronger proof of Arson’s devotion, both to the Truth (always written with a capital T!) and to his master. An agreement is reached by the two men. One agrees to pay 108,000 francs in 17 yearly payments of 4,000 and various notes and deeds totalling 40,516 francs. The other promises to disclose the guiding principle of the universe, the Truth itself. The deal seems fair to both. They arrange the financial matters and mark the 15th August 1814 as the date when the Absolute is to be revealed. Unfortunately, Wroński panics two weeks before the day and breaks off the agreement. It once again appears that the knowledge he possesses is worth unimaginably more than what people are willing to offer. Arson sends Wroński a pleading letter and the master relents. Perhaps he is touched by Arson’s devotion to the Truth. More likely, it is the new house that he receives, one with a yard, a garden, stables, and furniture alone worth 20,000 francs. The philosopher asks for some time and schedules the big revelation for 9th October 1814. He keeps his word this time and finally reveals to his loyal pupil the Truth itself, the Absolute. There, however, remains to be said what the formula entails. He asks Arson to return for the specifics the very next day, but ultimately decides that the banker is not yet ready to possess this knowledge. It should, understandably, be in the possession of those who can understand both it and the responsibility it entails. In the meantime, however, Wroński goes to the authorities to secure his 108,000 francs with an official deed of property, informing the officials that it was his payment for the information he gave to Arson. After all, he had fulfilled his contractual obligations, had he not? Arson seems to agree, as he does not speak out against his master. In fact, he decides to devote himself to ‘the spreading of Truth on Earth’ and to publishing Wroński’s work. The revelation gives the banker so much trust in his master that the two decide to join their estates (excluding, however, Wroński’s 108,000 francs and Arson’s properties in Nice). According to Arson’s estimates, his finances in Paris amounted to 350,000. But in 1816, he is soon forced to admit that despite his own frugality, most of it has already been spent. Much of this spending has to be attributed to the costly business of publishing the books of Wroński that, sadly, did not find a broader audience. Another part of it is most likely the result of the philosopher’s lavish lifestyle. Among the things that he buys with the common funds are portraits of himself, diamond rings and golden medallions. From time to time, Arson tries to warn him about unnecessary expenses and shows him the state of their now common funds, but this stops Wroński only for short periods. From time to time, Arson feels homesick and wants to return to his family in Nice, but Wroński always manages to convince him to stay, claiming that this would put an end to the publishing and would be detrimental to the Truth’s vital spreading throughout humanity. In exchange for his patron’s loyalty, the philosopher takes him to the most expensive restaurants in Paris. The man hesitated a bit, but since the Absolute is of course the paramount good, he got rid of his 300,000 francs, the source of all evil, and returned home absolutely happy. And broke. On 26th December 1816, Arson comes to a decision. Remembering that he has not paid off Wroński and fearing that the payment of the debt would damage his Nice estate, he takes most of the money he has left in Paris – 34,825 francs in various notes and deeds due in 1817 – and goes to meet Wroński. He gives him the 34,825 francs and asks for the forfeiture of the remaining annual payments of 4,000 francs. Wroński takes the money, but he does not say anything relating to the payments. It is impossible for me to assume in you any intentions other than the intention to discover the Truth. And since you decided that in order to fulfil this intention on Earth I should submit my will to you, I, for the last time, shall use my reason to devote my person to you so that you could use it as a tool… Give me your orders! I will be obedient. This obsequiousness pleases the philosopher. All Wroński wants is to spread his findings and to enlighten humanity. Petty disputes over money are not something that aids this cause. He agrees to Arson’s plea and the men continue their work for some time without any further disturbances. One day, Arson, while going through the books, stumbles upon ‘a new method of counting square roots’. He shows it to Wroński, who dismisses the findings, but the banker notices a tinge of jealousy in his master’s reaction. This rather human reaction breaks the spell that the philosopher has had over him and for the first time, Arson gathers the courage to ask in person for the return of the deeds. Wroński replies that he ‘can be absolutely tranquil as to them’. Unsatisfied by his confrontation with his master, Arson decides to return to Nice without saying goodbye. He works there on mathematics with, in his own words, ‘moderate success’ and considers himself free from the philosopher and his debts. After five months of such bliss, he hears a knock on the door. It’s Wroński, demanding the payment of the debt. He claims that without the money, he is unable to continue ‘our great goal, the publication of our discoveries’. Arson refuses and the two men do the only reasonable thing: they both go to the authorities. Wroński argues that Arson owes him around 80,000 francs – the remainder of the annual payments and the rest of the non-annual notes. Arson claims that Wroński holds unlawful claims to a debt that has already been paid and adds that he spent 200,000 francs on ’astronomical instruments, books that should be considered one of Paris’ greatest libraries, furniture, the day-to-day livelihood of Wroński and his family, and travels’. He demands the return of the deeds, the furniture and the books, and instructs the banks not to buy or cash any notes signed in his name. The case quickly reaches a massive scale. The men don’t just exchange letters, but publish testimonies in newspapers, allowing their dispute to be widely reported. Interestingly, although the men slander and threaten each other over money (Wroński even accuses Arson of father-killing, with Wroński being the father), they never question during their conflict what has been at its centre from the very beginning: the Absolute and the validity of the transaction. In fact, Wroński’s belief in the truthfulness and quality of his findings is so great that he even calls the money owed by Arson the ‘Holy Debt’. He even asks the banker whether what he learned was worth the asking price (a price that was, according to Wroński, relatively modest as he would not have sold the formula to anybody else even for millions) and adds that if Arson says no, he is prepared to forfeit any claims to anything Arson might owe. The banker initially says that the Absolute has been worth what he agreed to pay, but quickly withdraws his answer, probably realising that this would have made him lose the case. In fact, Arson’s faith in the Absolute is so great that he never really doubts it. At one point, he is overcome by suspicion and reasons that he should escalate the conflict, because Wroński might be a ‘despicable rogue’ and a fraud who should be exposed. But, as somebody who possesses and understands the supreme good, he cannot be evil. This means that Wroński went to court only because he is counting on the scandal giving his works much needed publicity. As such, it is in the interests of Arson, Wroński and, most importantly, the Truth, for the trial to go on. Although the financial aspect remains important for Arson (he still believes that Wroński’s claims are not legitimate), he now sees the case as dealing with something more substantial – the fate of humanity. His suspicions are confirmed when, as he writes in his memoirs, he is contacted by a secret society claiming that Wroński does in fact possess the Absolute, but only its intelligible form. There also remains the spiritual side, something that Wroński cannot learn because humanity is not ready for the Truth. This secret society claims that the philosopher must be stopped. Arson decides that either his former master is in danger, or that Wroński himself is behind the society. Both possibilities confirm his previous conclusions that he should create a scandal to bring the public’s attention to Wroński’s publications – he decides to contact his former master and tell him everything. Wroński likes the idea of gaining publicity thanks to a scandal, but he does not think Arson should be trusted. After all, one of them is in the wrong regarding the money, and since both of them have the Absolute, both of them should be good and wise men. He concludes that Arson must be possessed by the devil (brought to earth by the secret society) and condemns him as such in the press. As we will see later,this idea of the ‘secret cohorts of hell’ working against him did not ever abandon Wroński once it took hold. In 1818, the court reaches its verdict. Due to many inconsistencies in Arson’s financial claims and the fact that what Wroński sold could, in fact, be considered the formula for the Absolute (something Arson never questioned), the authorities ruled in Wroński’s favour. Józef Ujejski, the author of O Cenę Absolutu (editor’s translation: For the Price of the Absolute), the most detailed book on the trial, argues that Arson believed that since what he spent on Wroński was far more than what he owed him, the debt was settled. As such, he was unable to prove that he paid off any part of the debt. In fact, even the payment of 34,825 francs made on 26th December 1814 was not the repayment of the debt, but a sum that was to convince Wroński to forfeit the debt altogether, so that the Nice estate would not be damaged. In the end, Wroński agrees that he should be paid only 30,000 francs by Arson. Even though he initially claimed that the sum of 26th December 1814 was supposed to cover the cost of publishing and not be a repayment of the debt, he agrees to reduce it from the sum of 80,000 he wanted to receive. In addition to that, he is so overjoyed with the increased interest towards his works which the trial has brought, that he lowers Arson’s remittance even more, estimating that the banker spent between 10 and 15,000 francs on the trail itself. The money does not, however, secure his future as it was initially supposed to – a couple years later, he was already broke again. After the trial, Arson cuts any ties with Wroński and devotes himself to his family and the management of his Nice estate. However, in 1830, he is overcome with a sudden realisation that he must continue the pursuit of Truth and proceeds on working with what he has learned from Wroński. He declares himself a prophet that has to work towards the enlightenment of humanity. Yet at the same time, he claims that apart from knowledge of German philosophy, he did not learn anything from Wroński and denounces him as an ‘immortal shadow’. He continues to work on longwinded and rambling writings until his death in 1851. As for Wroński, it can be argued that his most important contributions took place after the trial. Nowadays, he is perhaps best remembered as a mathematician. At the end of the 19th century, a determinant was discovered in Wroński’s writing and named the Wronskian. It is still sometimes used in the solving of differential equations and many other ideas of Wroński are discussed by mathematicians – he is sometimes called the ‘Sphinx of mathematics’, because he hid the proofs of his equations instead of presenting them clearly. But he is also the author of around 100 published works and a fascinating (and complicated!) philosophical system that was widely influential in many different periods. Although the ethical side of his relationship with Arson can be considered at the very least controversial (Ujejski even goes as far as to condemn Wroński as immoral), the dispute itself clearly points to Wroński’s greatest ambition: the pursuit of Truth and the happiness of humanity, sometimes regardless of the costs. The Absolute he claimed to have discovered is an idea strongly influenced by the German idealists of the 19th century, particularly Friedrich Wilhelm Joseph von Schelling. In Schelling’s philosophy, to put it in simple terms, both nature and spirit are guided and united by a single principle – the Absolute. Both the creation of the natural, or the physical world and the development of the spiritual, or the intellectual dimension (culminating in the existence of people who are both a part of nature and can understand it intellectually), follows from this principle. Wroński believed that Schelling stopped a step too early. He correctly deduced the guiding principle that encompasses both physical and spiritual reality, but falsely believed that the only thing we can do with the Absolute is to gain knowledge about it. Wroński thought that the Absolute should be developed and, just as it created reality, our knowledge of the Absolute and what it entails would allow us to use it to shape and transform the world. This was not to happen for the sake of control, but for the sake of the ultimate goal – the happiness of humanity, which entailed the unity of philosophy and religion, as well as the creation of a federation of European nations (perhaps the fathers of the European Union owe some credit to Wroński). As such, Wroński considered philosophy (well, his own philosophy) to be the Messiah that will bring this salvation to people on earth. It is Józef Maria Hoene-Wroński that introduced perhaps the most influential and original concept in the history of Polish philosophy: the concept of messianism. It influenced the works of such philosophers as August Cieszkowski, Bronisław Trentowski and Karol Libelt. But perhaps the most important thinker on whom Wroński left his mark is Poland’s national bard Adam Mickiewicz. In his Paris lectures, Mickiewicz did not try to hide his praise for Wroński’s concept of messianism. However, there was a problem. Mickiewicz used the notion to promote his own idea of messianism and Messiah, one influenced by the revelations of his spiritual guru, Andrzej Towiański, while the rationalist character of Wroński’s thought was something that he treated with suspicion. This led him to proclaim that all rationalist messianist systems are false and that only his own and Towiański’s have any value. This infuriated Wroński, who suddenly realised that the ‘secret cohorts of hell’ and Satan were no longer using Arson to stop the spread of the Truth, but were now using Mickiewicz! He called Mickiewicz a ‘miserable poet’ and a ‘shameless plagiarist’ and accused him of stealing the concept of messianism in order to discredit Wroński on behalf of the ‘secret bunch ruling the world’. This was, of course, all done to make sure that humanity never achieves the happiness due to be brought by the realisation of Wroński’s philosophical system.